Visit Mexico? ¡Sí, se puede! That’s right! Yes, you can! Once again you can take that short boat ride across the Rio Grande for a day trip to Mexico. 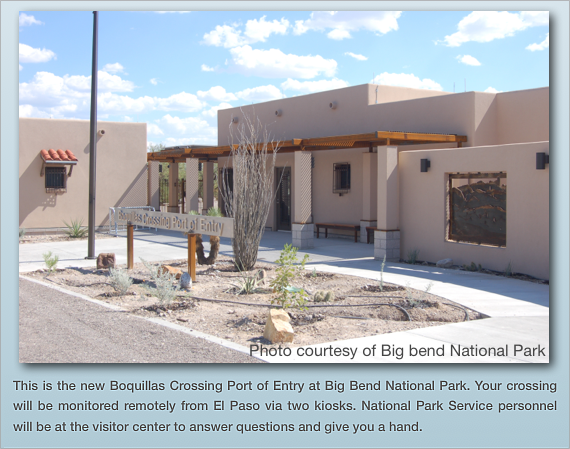 The Boquillas Crossing Point of Entry is now open at Big Bend National Park. There are many things you need to know before you even leave home. Everyone, including children, will need passports or passport cards. You may not take your vehicle into Mexico. You may only cross Wednesday through Sunday from 9 a.m. until 6 p.m. You may not bring back food or drink. Those are the basics, let’s get on with the visit. First, make your way to the Boquillas Crossing Port of Entry. As you head south on Park Route 12, your turnoff is on the left after you go through the tunnel and before you get to Rio Grande Village. Once at the Port of Entry, park your car. You cannot cross in it. Gun owners should know Mexico has very strict laws concerning firearms and ammunition. You may not take a firearm into Mexico. No ammo, no empty cartridges. You actually can get into more trouble than you’d believe if you just have ammunition on you. Secure your weapons safely on the U.S. side before you cross. You have all sorts of travel choices once you’re in Mexico. Of course, you can walk the mile or so into Boquillas. You can hone your equestrian and bargaining skills by negotiating the price for a ride on a burro or, if you’re really good, a horse. Finally, see what kind of a deal you can make for a ride in a pickup. That also will cost you, but it is negotiable. In all cases, you can negotiate a round trip if you like. In Boquillas, report to Mexican immigration and fill out a form. It doesn’t take long and it is required. So, what about the place itself? “Boquillas is a dusty, border hamlet but the people there will be delighted to see you,” a Customs and Border Protection official told us. Boquillas offers souvenir shopping, ambiance, old-style cooking, musicians and places to wet your whistle and recover. No matter how much fun you’re having, remember the port of entry closes at 6 pm, and you need to start heading back around 5 pm, 5:30 pm at the latest. When you return to the U.S.A., you go to one of the Customs and Border Protection kiosks in the Boquillas Visitor Center. First, you put your documents into a tray. Then pick up a telephone handset and talk with a Customs and Border Protection officer in El Paso. He will be reading your documents at the same time. If all is in order, the transaction takes 30 seconds to a minute. There are two kiosks in the National Park Service visitor center. Park personnel will be there to help if you need it. You may only bring back souvenirs and trinkets. You may not bring any food or drink back into the United States. Yes, that means no tequila, beer, wine or alcohol of any kind. Don’t bring back any Mexican Coke™ either, of any kind. If you buy food and drink in Mexico, consume it in Mexico. Why? The Boquillas Port is not equipped to handle items that may require duties to be paid. You also can bring back some great memories. If you can make the trip, it’s definitely worth your time and more than worth your money. Just remember you are in a foreign country with different laws and customs. We want you back.